Home » Comics Reviews » Stranger Things #1 Review! Written by: JediJondee46 on October 2, 2018. Stranger Things is a sensation, the Netflix show, and even a maze at Universal Studios Halloween Horror Nights! Now there is the comic book from Dark Horse Comics. 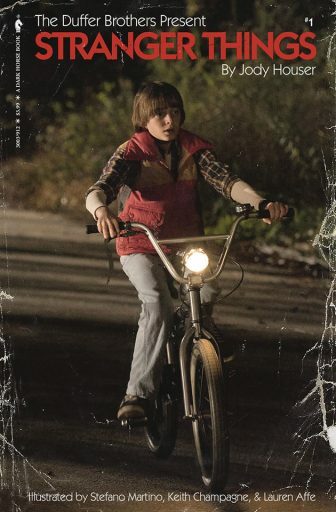 It features a photo cover of Will Byers (Noah Schnapp) on his bike. There is nice painted covers by Aleksi Bricolt which has Will with his walkie talkie and upside down, the Dungeons & Dragons group, Will possessed with the Demigorgon behind him by Rafael Albuquerque, and another one by Kyle Lambert which has both characters and the D&D group. “Chapter One”, no sub-title like the episodes, is written by Jody Houser, she wrote Poe Dameron Annual #2 and Mother Panic for DC Comics. The artwork is by Stefano Martino, the Italian artist who has worked for IDW drawing such issues as George R.R. Martin’s Doorways. The comic book focuses on Will running from the Demigorgon that was in the first episode, “The Vanishing of Will Byers” (2016) written and directed by the Duffer Brothers. We had Will riding his bike and encountering a dark form at Mirkwood. He falls and leaves his bike behind to run to his house. The narration picks up the story with Will chased by the shadowy Demigorgon. It is kinda bright when it was a night scene, but good depiction of the scene and characters. He is chased to the shed and frantically loads the rifle when the light bulb flares up. We get a scene of Will transported to the Upside Down, his face distorted. We can see the shed in the Upside Down covered with strange vines. The Demigorgon opens it’s mouths like a flower petal and roars. This flashes Will back to his D&D game with the argument with Lucas Sinclair (Caleb McLaughlin) and Dustin Henderson (Gaten Matarazzo) over what spell his magic user character should cast. Will raises up the rifle, we get a full splash page of the Demigorgon closing in and Will fires the gun, he screams, “Fireball!” He opens his eyes to see the Demigorgon has gone. We never got to see how Will survived the Upside Down, what happened with the rifle, we did see what happens to the victims of the Demigorgon. He returns to his darkened house, covered by the strange vines, then rests with the rifle. The Jaws poster behind him is brilliant, like he is about to be swallowed, the Demigorgon had a tooth-filled maw. Will falls asleep in his vigil. It flashes back again to the D&D game with Mike Wheeler (Finn Wolfhard), dungeon master, laying down the rules for his players. We even get a peek at their game play imaginations. Will wakes up and finds that he is alone; separated from the party. He sees in cartoony figures what happened to his magic user, Green Dragon, and resolves to return to the real world. He heads back to Mirkwood and sees Castle Byers, Will’s tent out in the woods. Will hears voices and there is a bright light, it is Eleven (Millie Bobbie Brown) in the burger shirt running away from Benny’s Burgers, it seems like she is a spirt of the woods, and fades away. Will hears the voices calling out his name. He returns to his house and braves reaching under his bed. Will gets his walkie talkie and hears the voice of his mother, it is cut off before he answers, the Demigorgon is there! I imagine that this is canon in Stranger Things continuity. If so, this is an absolute must for fans of Stranger Things! Five Walkie Talkies out of Five!